After a couple of days not going to sea, we were all eager to return to the water so, not to be deterred by a little bit of rain, we all geared up in waterproofs and headed for Gansbaai Harbour to launch on Dreamcatcher. Usually we would launch from Kleinbaai Harbour however a particularly low tide meant that we would launch from the deeper harbour instead. 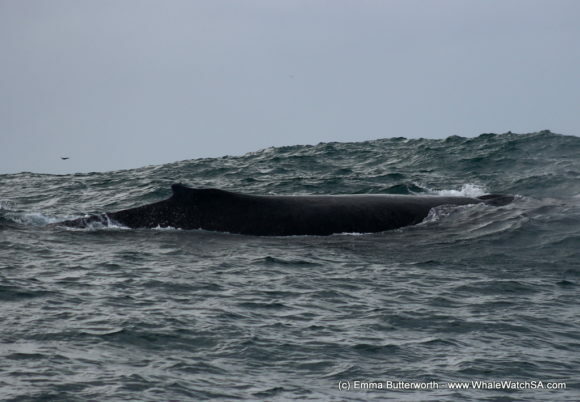 Our first sighting was a Humpback Whale, a great way to start the weekend! This beautiful animal surfaced next to our boat and it was lovely to be able to hear the whale breathing. The spouts that we use to find our whales are formed when the warm air from their lungs is expelled into the air and condenses in the colder outside temperatures. One with a trained eye can even tell different species of whales apart by the shape of the spouts. 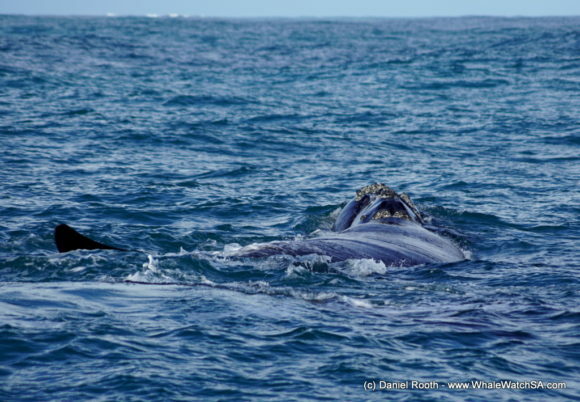 A Humpback whale has a tall bushy blow which is very different from a Southern Right Whale blow, a V-shaped blow. While waiting for the whale to surface, we also had a quick sighting of a juvenile African Penguin which swam past. 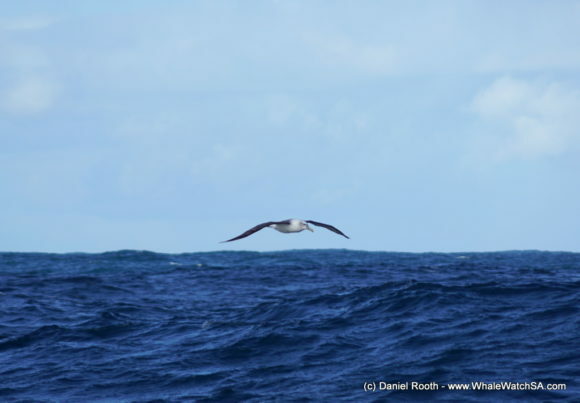 Plus, there were many pelagic birds flying around today, including Shy Albatross, White-chinned Petrels, Subantarctic Skuas, and Sooty Shearwaters. 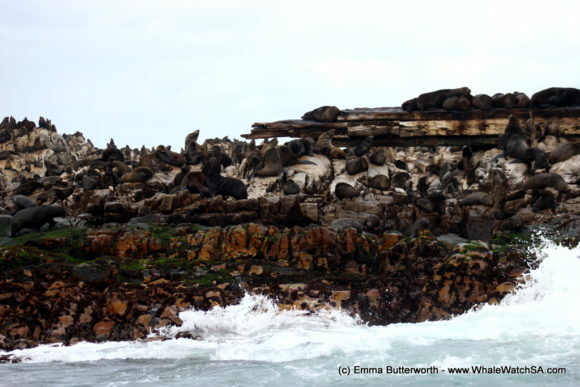 After moving on from this whale, we visited Dyer Island and Geyser Rock to see our Cape Fur Seal colony. This species is called a “fur seal” due to the two layers of fur that keeps them warm in the cold Atlantic waters. Next, we took a quick stop at our sister company Marine Dynamics, where we were lucky enough to see a Great White Shark which was the 4th of our Marine Big 5 that we saw on our trip. 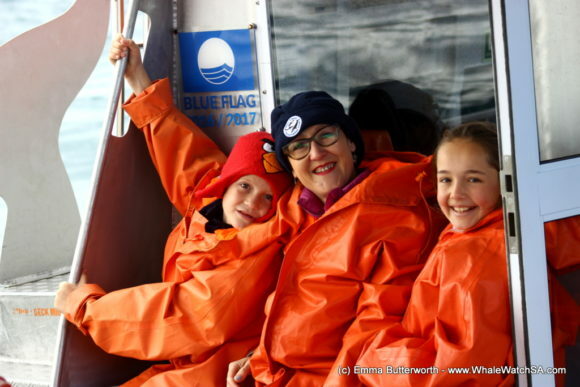 We began to head back to the harbour but unexpectedly our experience wasn’t over yet! 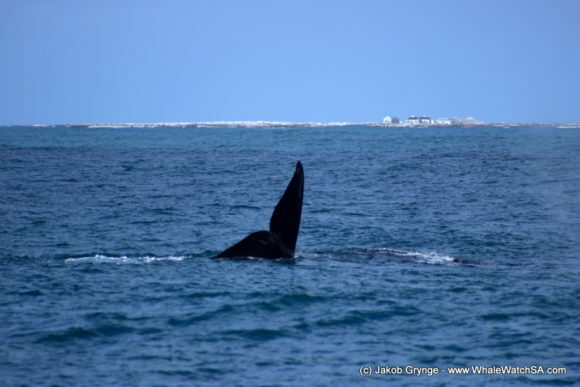 We suddenly spotted a pair of Southern Right Whales (identified at first by the blow as above). As a great end to the trip we were shown one of the whales flukes. 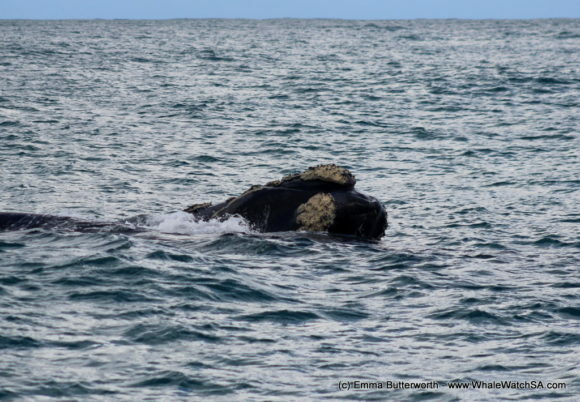 The flukes of Southern Right Whales can grow up to 5m from tip to tip! 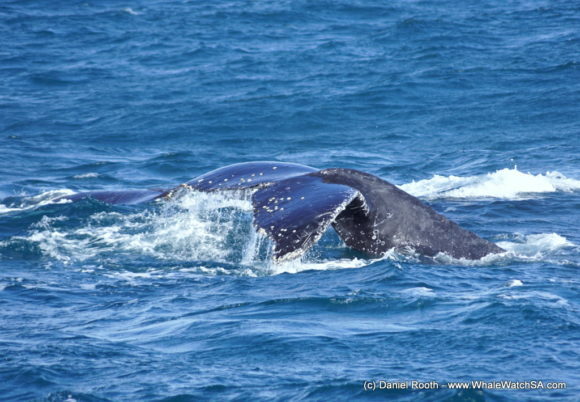 So overall, a trip with 4 of the Marine Big 5 and two different species of whale was a nice way to return to the water. After those two had moved off we were on our way to Dyer Island when we spotted some more whales and as we got closer found ourselves in a very fascinating situation. 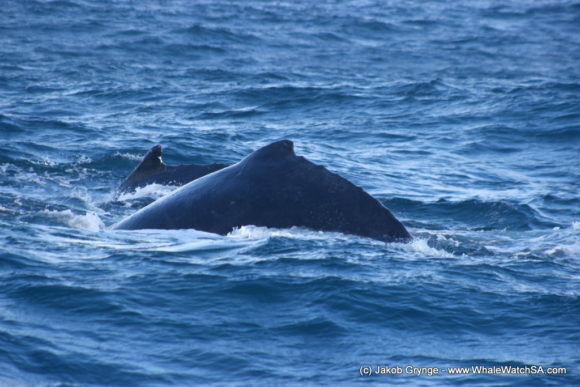 Five Humpback Whales, one female and four males, showing clear mating behaviour! 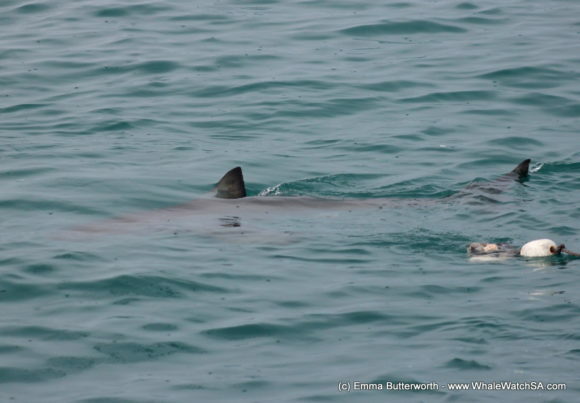 They didn’t even bother to notice the boat as they kept surfacing all over the place, giving us great views of their flukes, pectoral fins, snouts and even bellies! During our stay a fifth male joined in on the fun and made the sighting even more amazing. Moving off to Dyer Island we cruised into Shark Alley and were welcomed by our 60.000 strong Cape Fur Seal colony on Geyser Rock. Enjoying the warm sun, they were stretching out on the rocks as well as swimming and sticking their flippers out of the water to cool themselves. This process is called thermoregulation. On our way back to the harbour we stopped at our sister company Marine Dynamics but as the waters were quiet we soon took off again. Another stop for our interns to do a YSI reading, taking temperature and oxygen level of the water. Back in the harbour nobody could really get over the amazing sighting we had and over soup all the taken pictures we compared and discussed.